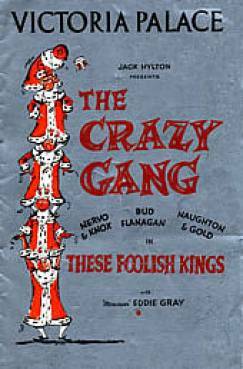 The Crazy Gang began their long and distinguished career during the 1930s at the London Palladium. 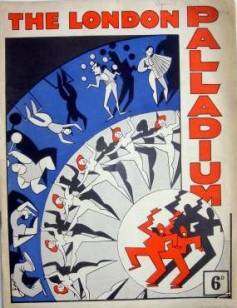 They dominated comedy at The Palladium throughout the '30s. During their nine-year reign there had never been another single attraction which had brought people to one theatre in such large numbers over such a long period. 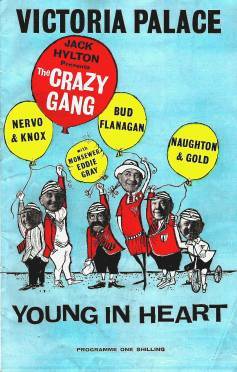 Inspired by the free-wheeling plotless revues pioneered by Nervo and Knox with Eddie Gray in the early 1920s, George Black presented his first Crazy Week at the London Palladium in November 1931, starring Nervo and Knox, Naughton and Gold, and Caryll & Mundy. The first show was booked for two weeks and ran for eight months. 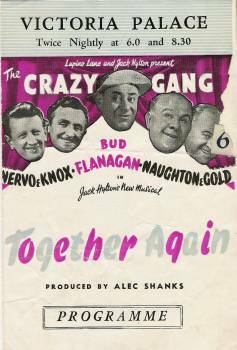 Crazy Week became Crazy Month when Flanagan and Allen joined the team in June 1932. 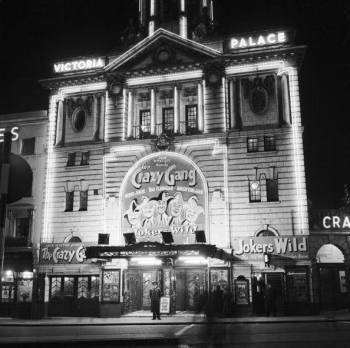 The 1933 show ran for fourteen weeks and from then until the Blitz of 1940 the Crazy Gang remained in residence. The first production to boast a title was the 1934 edition Life Begins at Oxford Circus. Caryll and Mundy left shortly after Flanagan and Allen came on board, and prior contractual obligations kept the other regulars out of the shows from time to time. 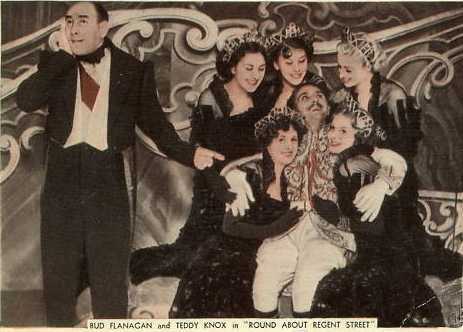 One celebrated temporary replacement for Bud Flanagan was Stanley Holloway. 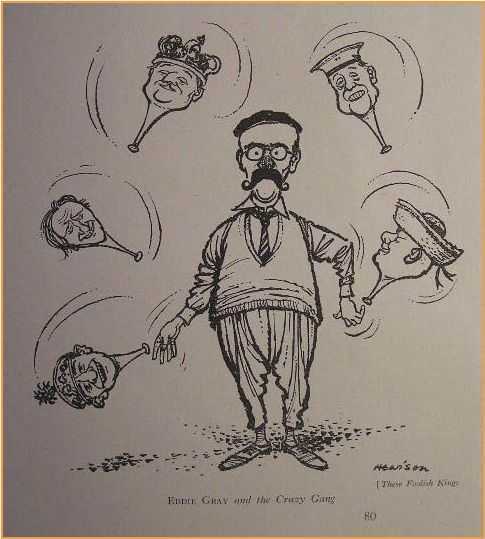 During the Second World War the Gang split into its component parts, performing for ENSA all over Europe, with Eddle Gray roaming as far as the Middle East. The other London theatre with which they were long associated was The Victoria Palace Theatre (right, top). 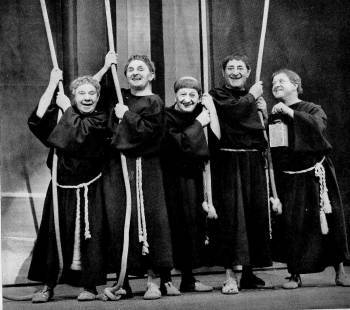 Their first show, Together Again, played for 1,566 performances and this was followed by an almost continuous run of Crazy Gang Shows. 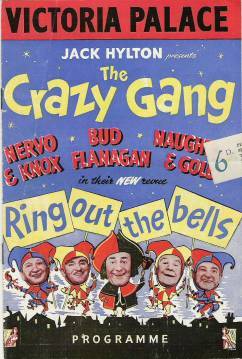 From 1951, the Gang consisted of Bud Flanagan (Chesney Allen had retired for health reasons), Nervo, Knox, Naughton and Gold, and now Eddie Gray rejoined the team. Nervo and Knox were always the highest paid, as their top billing indicated. 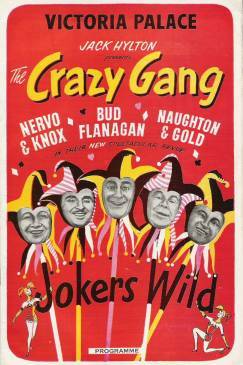 By 1959, the Gang had been together for 27 years and were all aged between 60 and 72. 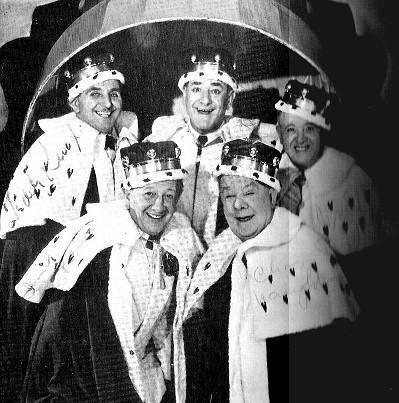 They had been threatening to retire for years, but kept being persuaded to do one more show - until their last show together on 19 May 1962. Jimmy Gold's health had caused him to miss most of the final two productions, though he did put in an appearance on that emotional last night of the last show. As one reviewer remarked about their last show at the Victoria Palace in 1962: "Two shows a night like this would kill anybody who had not been brought up as they were - hard-working boys in the business". 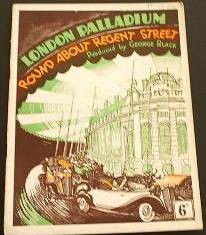 By 1934 the Palladium Shows began to have proper titles such as Life Begins at Oxford Circus, Round About Regent Street and All Alight at Oxford Circus, titles which reflected the Palladium's handy proximity to the the Oxford Circus tube station and which, in one show, featured an ambitious scene where everyone in the cast, including the band, represented people coming up out of the station. Another show in this era was called March Hares. 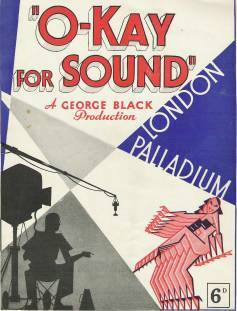 1936 O-Kay For Sound - A Musical Comedy Spectacle of Filmland and the making of a movie. Devised and produced by George Black; Assisted by Charles Henry. Book and lyrics by R.P.Weston and Bert Lee. Director of Music Jack Frere. Featuring Jimmy Nervo; Teddy Knox; Bud Flanagan; Chesney Allen; Charlie Naughton; Jimmy Gold; Joe Hayman; Phil Lester; Syd Railton; Patricia Bowman; Ray Sax & Bobby May; Lance Fairfax; Lino Carenzio; Harry Newman; Teddy Neal; Nancy Roberts; Chas. Schofield; Maurice Leverett;Enid Lowe; W.A.Haines; acrobats - The 4 Robenis; skaters - Mary & Erik; Sherman Fisher's Palladium Girls and Bob Busby's Sea Scout Band. 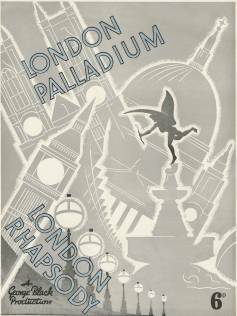 1937 London Rhapsody - A symphony of a great city. Devised and produced by George Black; Assisted by Charles Henry; Music by Michael Carr, Jimmy Kennedy and Harris Weston. Director of Music Jack Frere. Featuring Jimmy Nervo; Teddy Knox; Bud Flanagan; Chesney Allen; Charlie Naughton; Jimmy Gold; Len Lewis; George Lane; Raymond Newell; Henry Carlisle; Syd Railton; Enid Lowe; Yola de Fraine; Rosarito; Tubby Keezing; The George Macintosh Four; Harry Champion; The Ganjou Brothers and Juanita; Avon Vale Four; The 3 Omegas; De-Rekar and Kortz; Levanda & partner; Sherman Fisher's 24 Palladium Girls; Harry Dennis' Six Dancing Dudes; Mary Young; The Gipsy Boys' Band from Budapest; The Wiere Brothers; Cardini. Devised and Produced by George Black; assisted by Charles Henry. Book by George Black, Bert Lee and Harris Weston. Director of Music, Clifford Greenwood. Featuring Jimmy Nervo; Teddy Knox; Bud Flanagan; Chesney Allen; Charlie Naughton; Jimmy Gold; Kitty Reidy; juggler - Bob Dupont; Fanica Luca; The Stuart Morgan Dancers featuring Lita D'Oray; Gerry Fitzgerald; Jennie Gregson; J Sherman Fisher Girls with Marie Wilson; The De Tuscans; Ken Davidson; Hugh Forgie; Syd Railton; Princess Kuulei; Manley & Austin; Joe Tobin; Sue Ryan. A big hit was the scene which opened with five pairs of enormous bloomers hanging on a line. On the seats were the names of Hitler, Himmler, Goebbels, Ribbentrop and an extra large pair for Goering. A new song was commissioned entitled 'We're Going to Hang out the Washing on the Siegfried Line'. Another well remembered song from the show was 'Run Rabbit Run', a song which helped to carry so many people through the War. The show ran for 461 performances. Devised and produced by George Black assisted by Robert Nesbitt; Dances and Ensembles by Wendy Toye assisted by Joan Sherman Fisher; Palladium Orchestra under the direction of Clifford Greenwood. 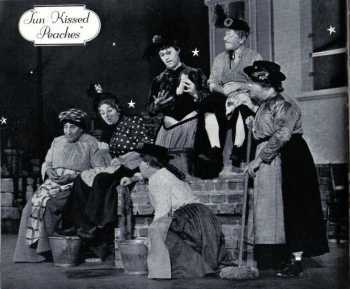 The cast included: Jimmy Nervo; Teddy Knox; Bud Flanagan; Chesney Allen; Charlie Naughton; Jimmy Gold; Dan Donovan; Mary Young; Jimmy Hadreas; The J. Sherman Fisher Girls; The Condos Brothers; Patricia Leonard; Marion Wilson; George Lane; Edna Squire Brown; E. V. Emmett; Cecily Thompson; Syd Railton; Willie, West and McGinty; The Fredianis. 1940 Top of the World - 4 September 1940. 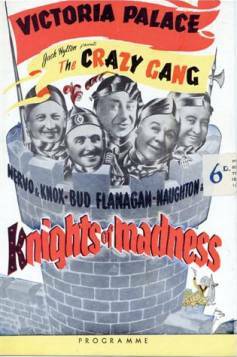 Starred Tommy Trinder, Pat Kirkwood and The Crazy Gang. The story was about a barrage-balloon squadron in which a balloon broke loose and drifted to another world ruled over by an extra-terrestrial queen played by Pat Kirkwood. 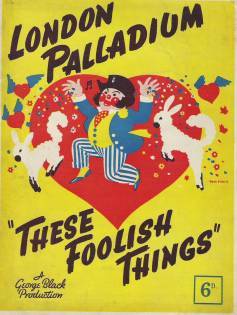 During the run of this show, the Palladium was forced to close under mounting pressure from so many aerial attacks. 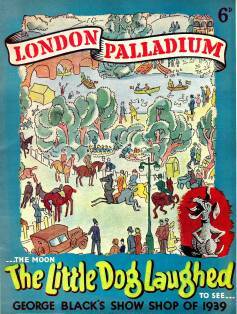 When the London theatres opened again after the Blitz, the first show that The Gang appeared in was a pantomime - Humpty Dumpty - at the Coliseum Theatre with Pat Kirkwood. Happy and Glorious - A show which echoed the triumphant and patriotic spirit of the times following D-Day. A meander down memory lane with Flanagan and Allen, appearing together in public, in a full show, for the first time since their partnership split in 1946. They reworked vintage sketch material and sang old favourites such as 'Underneath The Arches' and 'Run Rabbit Run'. 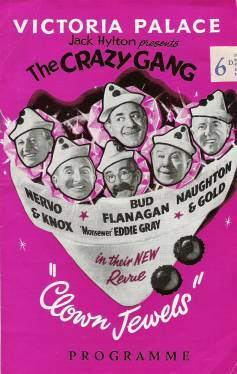 Also, Hubert Gregg's song 'Maybe it's because I'm a Londoner' was sung by Bud Flanagan for the first time in public in this show. A feast of nostalgia was guaranteed. 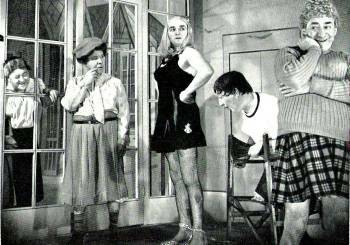 The show was reworked in 1957 as a series of six TV programmes which are preserved on film as a valuable record of the beloved double-act. 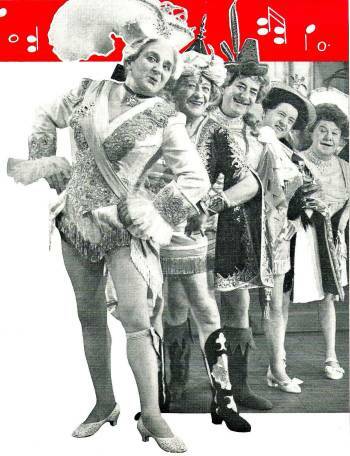 The cast included: Jimmy Nervo; Teddy Knox; Bud Flanagan; Charlie Naughton; Jimmy Gold; Zena Dell; Eric Whitley; Jean, Christine and Trudy Bentley; The Radio Revellers; Freddie Holmes; Ann Jay; Vera de Walde; Willie Carlisle; Grace Draper. Musical Revue in two acts. Original music and lyrics by Ross Parker; Comady directed by Charles Henry; Dances and ensembles by Joan Davis; Orchestra directed by Freddie Bretherton; Deputy musical Director William Davis; Staged by Alec Shanks. The Gang lost Chesney Allen from their line-up beginning with this show when he retired due to ill health (he eventually outlived all the other members). Musical Revue in two acts. Original music and lyrics by Ross Parker; Comedy by Charles Henry; Dances and musical ensembles by George Carden; Musical director Ronnie Munro; Staged by Alan Shanks. Revue devised by Jack Hylton. Comedy Scenes by William Shakespeare and Bud Flanagan; Comedy directed by Charles Henry; Music & Lyrics by Ross Parker; Choreography by Lionel Blair and Colette Brosset; Musical Director - Jack Ansell. Staged by Alec Shanks. Orchestrations by Billy Ternent. 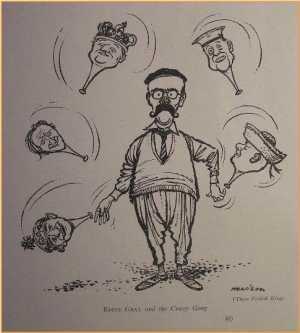 2nd January 1957 page as reproduced in 'Punch' magazine. Musical Revue in two acts. Comedy Scenes by Bud Flanagan and The Gang; Comedy directed by Charles Henry; Original music and lyrics by Ross Parker; Dances and Musical Numbers by Joan Davis; Musical Director Jack Ansell; Staged by Alan Shanks. Victoria Palace, London - March 5th, 1959. 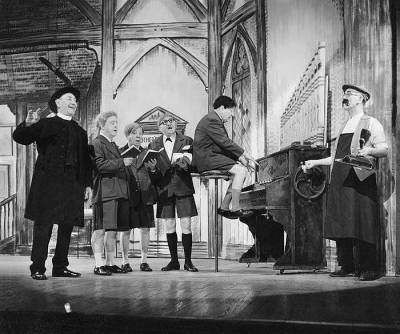 Revue by Bud Flanagan and the Gang; Music and Lyrics Ross Parker, Bryan Blackburn and Greatrex Newman; Dances and musical numbers by Joan Davis; Musical Director Jack Ansell; Staged by Alan Shanks. 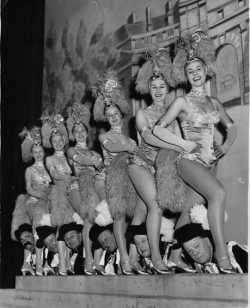 Bud Flanagan; Eddie Gray; Naughton and Gold; Nervo and Knox; Anne Hart; Bill Lynton; Pamela Austin; Roy Sone; Wllie Carlisle; the Ken-Tones and the John Tiller Girls.